From its headwaters in Minnesota to the mouth of the Ohio River at Cairo, Illinois, the Upper Mississippi River is flanked by diverse terrain sheltering a wide variety of wildlife. Nearby prairies make perfect havens for rabbits and mice. Possum, skunks, red fox, deer, woodchucks and wild turkeys scurry amid the trees in the hardwood forests that cover the high bluffs and hillsides overlooking the river. The waters are filled with fish and overhead, ducks and geese traverse the skies while bald eagles thrive in the upper branches of cottonwoods. That’s right. Bald eagles have returned to the Upper Mississippi Valley. In the 1960s, ecologist and writer Rachel Carson, who had publicized the claim that DDT was killing bald eagles and other birds, organized a bald eagle count along the entire length of the river that turned up only 59 individuals. Now, up to 2,500 bald eagles spend the winter along the Mississippi, with a smaller — though increasing — number staying year-round to nest. While most adult eagles that live in southern states will remain in their nesting area through the year, bald eagles that spend the mating season in colder regions must migrate to survive. In October, juvenile eagles in Canada and the northern reaches of Minnesota and Wisconsin are the first to leave. Even those migrating for the first time find their way by instinct. By mid-November, adult eagles that nest in these colder areas will also start to head south as their nesting lakes begin to freeze. It’s not the cold itself that poses the greatest danger when winter sets in. These birds are actually quite rugged. Instead, it’s the need for a stable food source that drives the migrations. Living in the cold requires more energy, and thus more food. In winter, an eagle must consume 6 to 11 percent of its body weight each day. Their primary food source is fish, supplemented by ducks, coots, carrion and small mammals. When ice begins to form their access to food is cut off, and eagles move to where the water is still open. The migrating eagles make their way by riding thermals, currents of warmer air that rise from the bluffs and hillsides lining the river corridor. When conditions are right, bald eagles can travel up to 270 miles in a day. But, when tailwinds dissipate or thermals are scarce, bald eagles will linger. In time, many will find their way to the Upper Mississippi River Valley, where stretches of the river are fed by tributary waters and do not freeze. Elsewhere on the river, human intervention has unintentionally created a favorable environment for raptors. At one time, the entire Upper Mississippi flowed freely from its source all the way to where it joins the Ohio River. In the 1930s, however, the US Army Corps of Engineers began constructing what is now a system of 29 locks and dams on the Mississippi. Where surging rapids and waterfalls once prevailed, humans created a navigable transportation route that supports both recreation and commerce. As it turns out, these changes were not only good for cargo barges that carry petroleum, coal, and agricultural goods. They were also good for the eagles. 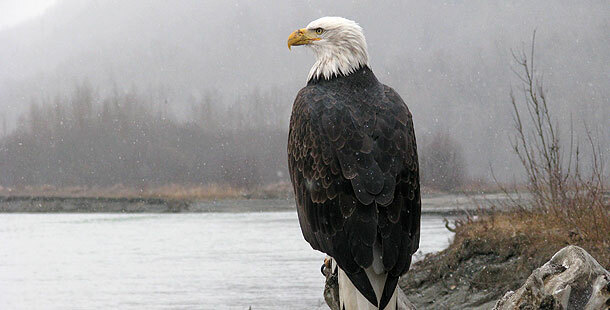 In winter, when bald eagles spend upwards of 90 percent of daylight hours roosting in order to conserve their energy, the fish that have been stunned or killed in the turbulent waters around dams provide an easy meal. Elsewhere, power plants use river water for cooling, then pump the warmed water back into the river. In these places, large groups of eagles can be seen gathering around the open waters, freed from the ice, where they can take advantage of plentiful, and accessible, supplies of gizzard shad and other fish. Near the end of winter, as early as February, those eagles that have migrated south begin to follow the thaw back to their northern homes. Others, like the nesting pair at the Iowa hatchery in American Eagle, never migrate. They stay within several square miles of their nesting site throughout the year. During the spring and summer, all the eagles in the area become very territorial, protecting the resources that will sustain their young. But at least with the migrating “visitors” gone, the riches of the Upper Mississippi River Valley belong to its year-round residents.